Ok, yes well. This is one of those Timeslip Tuesday books where to identify it as such is a spoiler, but to not identify it as such fails to bring it to the attention of those who like time travel (and leaves me without a T.T. book for two weeks in a row). I'll try not to spoil any particulars, though. 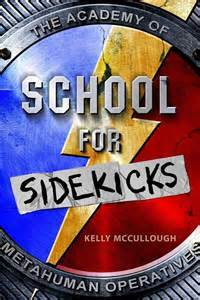 School for Sidekicks, by Kelly McCullough, is about an ordinary kid named Evan (nerdy and bullied, which is the norm in MG sci fi/fantasy these days) who dreams of becoming a super hero like Captain Commanding, fighting the bad super villains and saving the day. In Evan's version of earth, that's not as far fetched a dream as it would be in ours, because a strange bomb a generation back gave a bunch of people superpowers (and killed a considerably larger number), and even in Evan's time sometimes kids get powers...And Evan's dream comes true. He gets them. Enough powers to be taken by the government and sent to a special school for super power training, along with a bunch of other variously talented kids. So far, pretty ordinary story. Here's what makes it interesting--there are secrets at this school (like the fact that it's on Mars). It's not just a training school, it's a testing ground, and the reason the kids need to be tested is the same reason why no one actually gets to kill a super villain. Someone has come from the future because they know people with superpowers are going to be needed....And that is pretty interesting, and the time travel is used to good effect. On a smaller scale, things become interesting as well when Evan is apprenticed as a Sidekick to Foxman, an ex-alcoholic whose superpower is technological enhancement--every gadget he designs, or flying Foxcar he builds, works stupendously when he's the one using it. Foxman doesn't want to be a warm fuzzy mentor, but he and Evan work things out between them, and Foxman helps Evan build bridges back to his parents, upset because their son has chosen superhero-ness over family (and might get damaged as a result). Evan's too young for actual sidekick missions, but Foxman isn't a rule-follower, and the result is that Evan gets more adventures than most super-powered kids his age, dragging his classmates along with him. After a slow start in which Evan is mostly just whinny, the pace picks up and I enjoyed it more and more, and would very much like to read the sequel sooner rather than later! Note on diversity: for the first time since I started thinking about rainbow sprinkle diversity, I have found an example, one that bothered me quite a bit and kicked me out of the story: "The taller of the girls had the ball when I first spotted them. She was Native American, with long dark hair and a bright smile" (page 69). How the heck does Evan know a kid in this context is Native American? I don't think he can just by looking at her. And since the fact that she is Native American has no bearing whatsoever on anything she says or does in the rest of the book, it seems like she's identified as such just as a deliberate adding of diversity--a rainbow sprinkle.